The paid survey process is fairly straightforward. You sign up with a paid survey site and complete a member profile. Then, they send you an e-mail any time they have a survey that matches your profile. 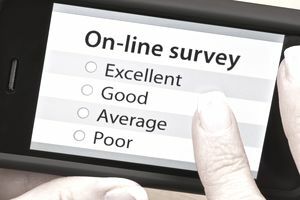 A typical e-mail invitation will include an estimate of how long the survey will take to complete, specify how you'll be compensated for your time (if you qualify), and provide a link to the survey. Expect to spend 15-20 minutes per survey on average. Payment for surveys can vary widely from site to site and from survey to survey. Expect to be compensated one of three ways: with cash (anywhere from $1 to $50 per survey), with points that can be redeemed for prizes, or with sweepstakes entries. In some instances, you may also be rewarded with new products to try. Have a specific type of reward that you'd like to receive (Amazon gift cards, PayPal deposits, cash)? Use SurveyPolice's Pick-a-Perk tool to look up survey companies that offer the reward you're after. Trusted Survey Sites- These are the survey sites that we use and recommend (they're open to U.S. residents). There are different survey sites you can try if you live in Canada. SurveyPolice- This website allows survey-takers to rate survey sites across a range of criterion: speed of payment, the reliability of website (doesn't crash during surveys), quality of customer service, recruiting practices, adherence to privacy standards, etc. It then uses this data to rank the sites and posts the top ten survey sites on its homepage. SurveyPolice also allows users to file complaints against survey sites and attempts to remedy them. Volition- This widely-respected website provides a database of "the best" paid survey sites based on pay and other criteria. Sign up for several survey sites to increase your chance of getting surveys. Keep your profile up to date. It's used to determine which surveys you qualify for. What Are the Top Paid Survey Websites to Try Out? What Are the Top Jobs With Free Room and Board? 6 Easy Ways to Get Serious About Saving.